What do The Salvation Army crest and shield signify? The Salvation Army is readily recognized around the world, but do you know how its symbols came to be? While the red shield is an internationally recognized identifier of Salvation Army service to those in need, the crest is a meaningful symbol of Salvation Army beliefs. 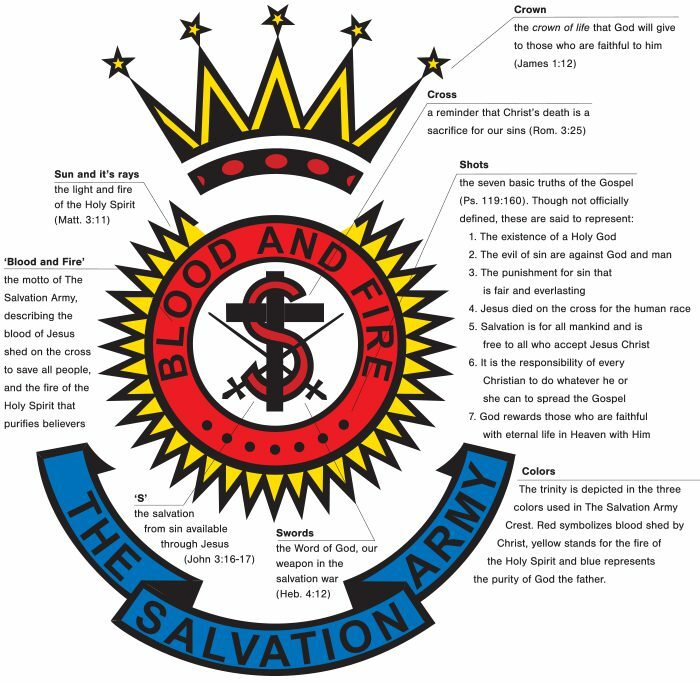 In 1878, 13 years after The Salvation Army’s founding, Captain William Ebdon suggested a logo—the crest—which he designed to proclaim biblical truth and the doctrines of the Army. Now the oldest official emblem of The Salvation Army, the crest is said to have first appeared on headwear soon after the 1878 Congress. In 1884, Founder William Booth applied to register the crest as a Trademark. Due to copyright issues after an officer broke away from Booth’s Army, The Salvation Army in the U.S. replaced the crest’s crown with an eagle around 1890. But when the copyright expired in the 1980s, The Salvation Army in the U.S. reverted to using the original crest. The red shield originated in wartime. At the turn of the 20th century, Founder William Booth sent officers to support British troops serving in the Boer War in South Africa. They provided refreshments, first aid, chaplaincy and worship for troops while wearing a silver shield with the words “Salvation Army” emblazoned across the badge. In the aftermath of the war, an officer raised concern that the silver shield worn by Salvationists would reflect light, particularly at night, giving the location of troops to the enemy. As a result, the silver was replaced by a red enamel and the badge became known as the “red shield.” As World War I ended, the Red Shield Club was founded for Salvationist servicemen throughout the world. Today, it represents the shield The Salvation Army provides to people in need of help spiritually, physically, financially or emotionally. Take a quiz on The Salvation Army symbols to test your knowledge.